Residents of the United States have the right to keep and bear arms. Up here in Canada, we have the right to keep and arm bears.Each one is unique, no two are alike. The shields are recycled earrings and pendants, giving each bear an added touch of identity. I'll rotate pictures of those available as my Knights of Beardom Collection changes. This is what happens when a chain knitter has entirely too much time on his hands. No dolls currently available. Please see the Gallery. 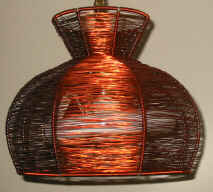 Here's one of my lamps. 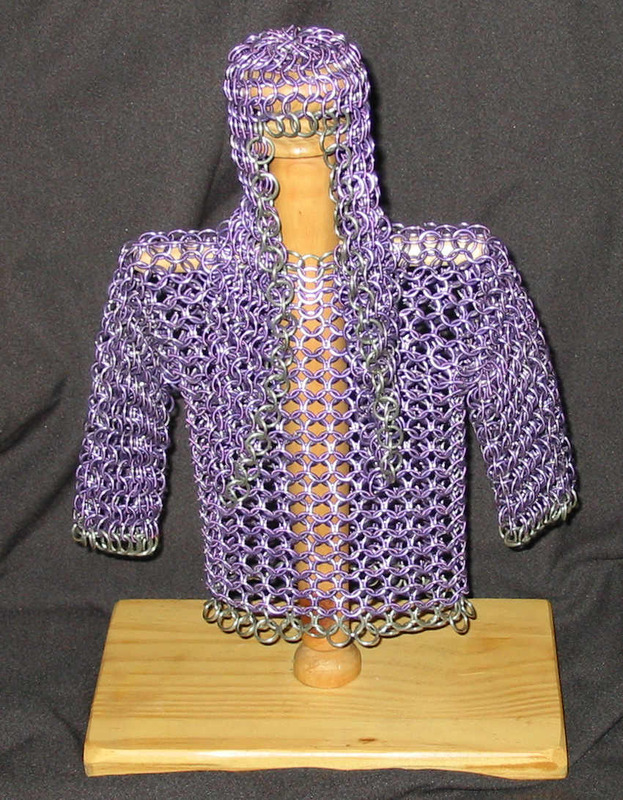 While not chainmail, it is wirework. I took the ugly frilly pink covering off of a swag lamp with a nicely shaped frame and wound it with hundreds of feet of red enameled magnet wire. There is just enough spacing between the wire to give a beautiful ambience to the room and a spot of light underneath; perfect for reading when hung over your favourite living room chair. Made with purple anodized aluminum in 5/16" X 1/16" rings, this piece features a stainless steel inlay in the chest depicting the runic symbol "Othila", representing home, origin, the end of the journey. The hood features stainless trim along the edges and two long dags in front. One only, I will never duplicate this piece. Price includes stand.